Your automatons and the dead are at your beck and call. First and foremost, I would like to thank everyone who has purchased a copy of the Tinker thus far. 100 sales in 40 days is absolutely phenomenal for a small .pdf publisher like myself. Every product I am currently cooking up is living in this little bugger's shadow and, really, that's not a bad position to be in. So, yes, thank you so very much! As I've said time and time again, it's you who keep the hamster wheel turning around here! Given their ability to command hordes of mindless and subservient minions, there has always been a bit of a rivalry between tinkers and necromancers. It is not a blood feud, by any stretch of the imagination. Rather, it can be thought of as much like the rivalries that exist between various educational institutions or between two professions that rub together the wrong way at times, much like alchemists and physicians. This rivalry, in a rather amusing paradox given how the two parties dislike each other, brings about an exchange of culture. Invariably, such a cultural exchange (the sort with a bit of acid between the two parties) brings about those individuals who attempt to bridge the gap between the two by embracing the tenants of both at once. These are the mechromancers, tinkers who have delved deeply enough into the necromantic arts to command both a squadron of mechanical minions and a squadron of undead minions. As they progress down this path, the line between machine and corpse blurs until it finally becomes one, at which point the two camps whose views they were attempting to integrate invariably agree that the mixture of the two concepts is an abomination and the mechromancer must be banished. The mechromancer is a mixture of spellcaster and tinker. Requiring both the alpha and the animate dead spell to qualify, among other, lesser requirements, the mechromancer fills the role that the mystic theurge does for conventional casters: useful abilities piled onto full progression in both of your esoteric arts. 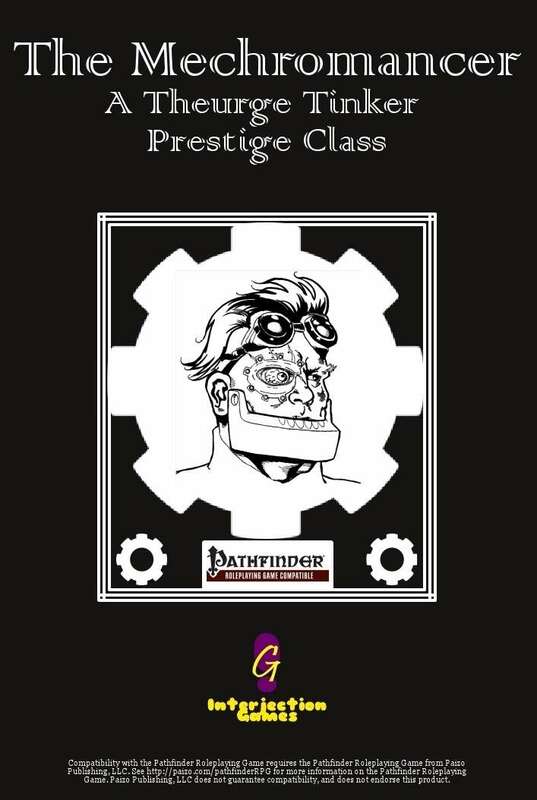 Unlike the mystic theurge, the mechromancer is only a 5 level prestige class. Also, given magic and tinkering tends to mesh less well than magic and more magic, the class has a glut of small, useful abilities to help blend the two ideas together in a logical fashion. The Blue Screen of Undeath ability, which allows the mechromancer to raise fallen automatons as "zombie robots"